How to Sign Up To Paribus App? Which Online Stores Work With Paribus? Paribus Works With Hotels too. Does Amazon Do Price Match? Is Paribus Free Or Does It Cost anything? Paribus App Availability: What Countries And Devices Is It Available in? If you shop online then there's a good chance some stores could owe you money. And I'm sure if you're like me then you wouldn't say no to getting cash back on some of your online purchases. You may be reading this article to see if Paribus is a scam or legit. You may have been looking for ways to make some savings when shopping online. The good news is Paribus is legit and you can get money when prices drop on products you've bought, deliveries that are late and when a hotel price drops. In this article, I'm going to tell you everything you need to know about this app that gets you money back with your online purchases. The Paribus App is easy to use and it completely safe. Paribus is owned by Capital One since 2016 and it has continued to grow successfully since it was founded. 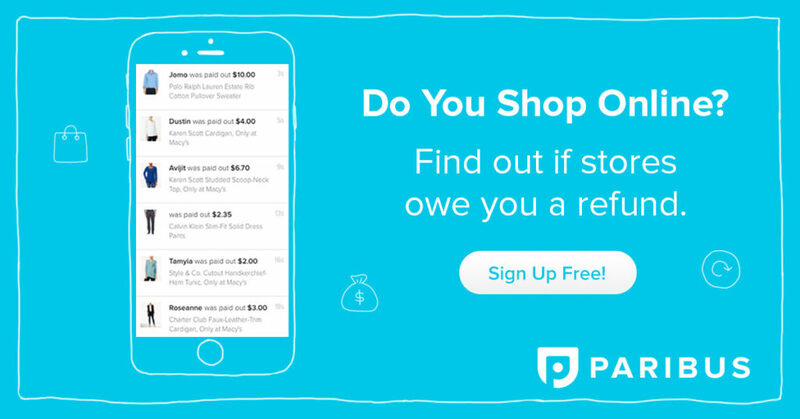 Sign up for Paribus here and find out if stores owe you a refund. Once you do that you'll be able to get the money you're owed in 3 ways. So let me explain in a little more detail how you'll save money using this APP. You just link your mailbox and Paribus will track the prices of what you bought, and actually get you the cash you're owed from the retailers directly. Paribus contacts the retailer on your behalf and files a claim requesting a refund or provides you straightforward instructions on how to do it yourself. It then monitors your email for recent order confirmations and then checks for price changes. If there's anything with an eligible claim then Paribus will detect it and let you know. Once Paribus succeeds in your claim you're then credited to the card you paid with or given store credit to use. Paribus charges you nothing for this service. The cool thing about this app is there's no minimum amount for cash out as the retailers refund you the amount they owe direct to you. It can be super frustrating when you want to cash out your money and there's a $100 minimum cashout amount. Whether it's $5 or $500 you'll be able to get your refund that you're owed. Paribus doesn't need your bank details as the retailers will be refunding you directly for any retails price drops, late deliveries or hotel price drops. When you use the Paribus App you do not need to give them your bank details. It makes people feel safe knowing that you do not need to hand over your bank details to use their price drop or late delivery service. The retailer will issue you the refund, not Paribus. The Paribus App works via your email receipts. You simply give the app permission to access your emails then it works in the background checking to see if any of your purchases are eligible for a cash back refund. Then it will notify you of any eligible claims which it will then take care of for you if you want it to. Paribus is up to date with all their policies so it knows when an eligible purchase is covered and will then work as the middleman to get any cashback owed to you. This is something I like the most as I travel and stay in hotels quite often. Sometimes you can book a hotel for $175 and then it'll be $125 on the very same day. Paribus works in real time to monitor price changes. Once a lower rate is detected, Paribus will contact you via email and let you know about the lower rate if your hotel is cancelable. If you want to proceed then Paribus will lock the new rate with Priceline, Booking.com, Agoda, Expedia or many of the other hotel sites they work with. They then process the cancelation on your behalf. Once all's been done and you've got the new lower rate Paribus will get you refunded the difference to the card you paid with. Again there's no fee to do this for you. Paribus does work with Amazon but in a different way. As Amazon doesn't offer price protection guarantees Paribus works by Amazon's delivery policy. If an order you place on Amazon has a guaranteed delivery date but it doesn't arrive on time then you may be eligible to get a refund on your delivery costs. Also, Amazon Prime members may be able to get one extra month if their deliveries are late. To clarify what was mentioned above, Amazon doesn't offer a price guarantee policy but they do have a shipping guarantee on eligible orders. Paribus will monitor this for you and make a claim if an order is eligible for a claim. Paribus is 100% safe and trustworthy as many customers will verify that with good reviews. It's understandable having concerns about giving access to your email but it's necessary for it to have access to your inbox to find your savings opportunities. Paribus takes your security very seriously and wouldn't jeopardize your information in any way. When the App has access to your inbox it uses smart logic technology to identify and check only the emails that appear to be receipts. They do not open or check any other type of email. If you were a bit unsure then you could create a separate email that you can use when shopping then give Paribus access to that email. If you don't allow the app access then it won't be able to work doing the price checking for you. Any data they use when tracking for savings is stored using powerful AES 128 encryption ensuring your data is safe and no one gets access to it. When you sign up you'll see it's totally safe and you'll be getting cash back in no time. Paribus supports Gmail, Yahoo!, Outlook webmail providers. If you use anything else then you simply create a shopping email address on one of the providers above. Paribus is 100% free and doesn't cost anything to you. Paribus doesn't charge anything to make the claims on your behalf and doesn't keep any of your cash back. It's a complete win for you! It all depends on how much you spend online. If you book a hotel which then drops $50 then it's a quick $50 cash back. The more you shop online then the more you can save. Most people do a large number of their purchases online, and if you can get just a bit back then it will be worth it. When you're owed cashback the retailer will refund the money owed directly to you. It's totally hassle free and you don't need to give any bank details to anyone. You can feel safe knowing your bank details won't be crossing hands with anyone else. It's nice and easy just how we like it! If you're a bit skeptical then you'll want to see how much people are saving using this app. When you sign up to Paribus head over to their deals page and it lists all the recent refunds people have got from using this app. But don't worry if you're an Android user as Paribus is available to use on ALL computers making it accessible to everyone. Sign up to Paribus using your computer here. Paribus is a great legitimate app that you'll love having working for you in the background getting you cashback that you're owed. As I'm sure you can now see Paribus is legit and not a scam. You've got nothing to lose and only money to gain. Paribus does all the heavy lifting. All you need to do is set it up then it does all the work for you. Thanks, I hope you found this post valuable. If you want to come back to this later then feel free to give this post a pin.